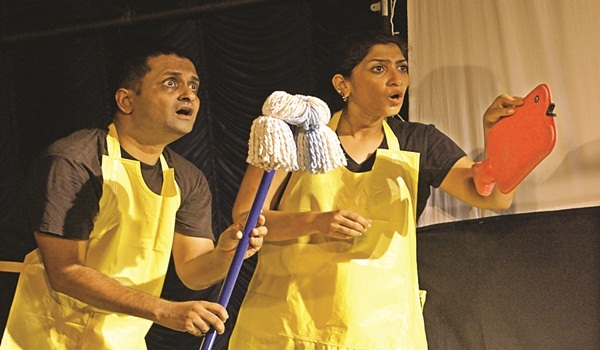 A cow with an attitude takes centrestage in The Sandbox Collectivea��s childrena��s play. An irritable cow, a bunch of harangued farm animals and a farmer who is at his wita��s end. So far it sounds like the perfect mix for a childrena��s play. But thata��s where I discover the cookie-cutter format ends, because Vinod Ravindran, the director of How Cow Now Cow, doesna��t believe in dumbing things down for the little ones. a�?Kids are really smart and they understand much more than adults give them credit for,a�? says the Bengaluru-based actor-director, explaining how the 50-minute performancea��by Sachin Gurjale, Rency Philip and Anirudh Mahesha��is a layered one. The actors don the roles of the animals and of storytellers, and move in and out of multiple characters. a�?I had read Rosemarie the Cow, a German play by Andri Beyeler, years ago at a workshop. And it had stayed with me because of the simplicity of the story. Then, last year, when we were talking about doing a play that could be easily taken to schools and little spaces where you cana��t usually perform, I proposed we work on this,a�? says Ravindran. Since the actors dona��t believe in following a script, they worked on it for five weeksa��improvising, figuring out who is telling the story and how to tell it. They also decided to use overhead projection (a�?ita��s more rudimentary, you can see an animal is moving because a hand is moving it; to me that is much more funa�?) and add elements of object theatre and shadow puppetry to give the narration more variety. a�?We also had to adapt it a little, so it made sense to our audience,a�? he says. Dona��t expect traditional costumes here (like a cow costume); the actors keep it real and rely on childrena��s willingness to imagine. There are no traditional sets, either. a�?Sets are boring, they are just there all the time,a�? chuckles the 40-year-old, who premiered his first childrena��s play, Raja Tantra Choo Mantra, a few years ago at Ranga Shankaraa��s International Theatre Festival. a�?But I do use other things. Like my projection screena��we hide behind it, it becomes our house, our window, whatever we need,a�? he adds. The play is open to interpretation and Ravindran shares children have come to him with many. a�?The best was a little six-year-old girla��s. She wanted to know how it was possible for three people and a director to work together and create one thing, because she and her classmates can never agree on anything,a�? he laughs, adding that whata��s interesting is that a�?the idea of people working together is in the play, but as a very subtle ideaa�?. Ravindran, who is heading to Mumbai, to assist director Atul Kumar in his new play, A Midsummer Nighta��s Dream, is planning a couple of new plays, but this time his audience will be adults.